ALERT: Before you purchase, check with your instructor or review your course syllabus to ensure that you select the correct ISBN. Several versions of Pearson's MyLab & Mastering products exist for each title, including customized versions for individual schools, and registrations are not transferable. In addition, you may need a CourseID, provided by your instructor, to register for and use Pearson's MyLab & Mastering products. Packages Access codes for Pearson's MyLab & Mastering products may not be included when purchasing or renting from companies other than Pearson. check with the seller before completing your purchase. Used or rental books If you rent or purchase a used book with an access code, the access code may have been redeemed previously and you may have to purchase a new access code. Access codes Access codes that are purchased from sellers other than Pearson carry a higher risk of being either the wrong ISBN or a previously redeemed code. Check with the seller prior to purchase. -- Thematically introduces students to the major philosophic thinkers. 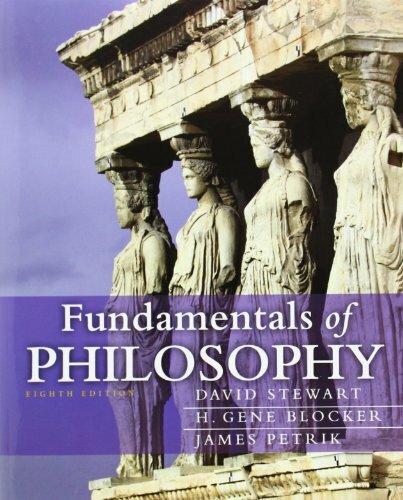 Fundamentals of Philosophy offers a broad scope of classic and contemporary selections from the world’s major thinkers via a narrative format that presents difficult issues and readings in a simplified manner for students. Its readings are grouped around nine major themes/chapters, and are organized as a debate on one central issue. This approach helps students understand the argumentative style of philosophy, and learn how philosophic issues and solutions they encounter can be applied to their everyday life. A better teaching and learning experience This program will provide a better teaching and learning experience—for you and your students. Here’s how: Improve Critical Thinking – “Questions for Discussion” and a “Glossary of Terms” help students study. Engage Students – “Biographies” and “Recent Developments” stimulate student interest and understanding of philosophy’s contemporary applications. Support Instructors – An Instructor’s Manual to accompany the text are available to be packaged with this text.